The first and second units of the KNPP project are likely to reach criticality in September 2012 and March 2013 and commence commercial operation by October 2012 and June 2013, respectively. The Russian-built $3 bn Kudankulam Nuclear Power Project (KNPP), which faced fresh protests today, should be operational soon. The loading of fuel bundles in the first unit is scheduled to completed by September 15. International Atomic Energy Agency (IAEA) observers would inevitably be attending the event. The first and second units of the KNPP project are likely to reach criticality (first start of fission chain reaction) in September 2012 and March 2013 and commence commercial operation by October 2012 and June 2013, respectively. The inspection of the Reactor Pressure Vessel using a specially designed remote controlled machine has just been completed. “We are presently doing the preparatory work. A team from the Atomic Energy Regulatory Board is expected next week. They will inspect the site and only after their visit we will load the real fuel. So, we hope to load the fuel by next week end,” Indian news agency PTI quoted KNPP Site Director RS Sundar as saying on September 2. Now that the first and second units of the KNPP are set to begin producing power soon, it is time for the operator Nuclear Power Corporation of India Limited (NPCIL) to increase funds for providing health, education and infrastructure development at the project site under its Corporate Social Responsibility (CSR). 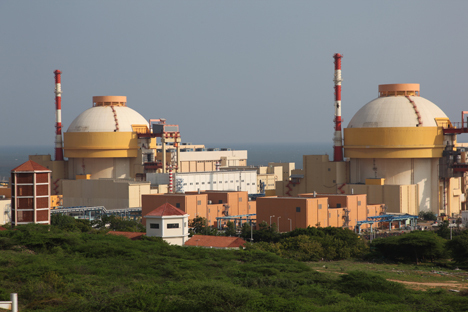 The government sources told the RIR that the funds allotted under the CSR are paltry and need to be enhanced considerably to make Kudankulam a model project which would silence critics of nuclear power projects all over India. Russia has advanced a credit of Rs. 6,416 crore (around US$ 1.1 billion) for the KNPP Units 1&2. The Prime Minister’s office (PMO) may take a call on this subject, though Prime Minister Manmohan Singh’s hands are full with a myriad of far more important issues. The government is not unaware that a pittance is being disbursed for Kudankulam under CSR. In fact, V. Narayanasamy, Minister of State in the PMO, told the Indian Parliament that NPCIL released nearly Rs 11 crore (around US$ 2 million) under this head during the last three years and in the current year. However, the minister was quick to add that apart from this amount, the government has allocated over Rs 500 crore (about US$ 90 million)for neighborhood development program around Kudankulam Nuclear Power Plant. On August 23, 2012, Narayanasamy had told the Indian Upper House of Parliament (Rajya Sabha) that Unit-1 of KNPP was at an advanced stage of commissioning. The permission for initial fuel loading and first approach to criticality was accorded by the Atomic Energy Regulatory Board (AERB) on August 10, 2012. Currently, preparations for fuel loading are being taken up. After completion of the fuel loading in the reactor, activities to approach the first criticality (start of the fission chain reaction for the first time), a major milestone, will be taken up in line with the approved procedures and AERB stipulations. After criticality, the full power operation of the unit will be achieved in steps in accordance with the laid down procedures. The Expert Group of eminent persons constituted by the Manmohan Singh government has addressed all the legitimate concerns of the local people. The government has also enhanced the public outreach activities, using a multi-prolonged approach to address the genuine apprehensions of the local people. The Inter-Governmental Agreement (IGA) between India and Russia on cooperation in the construction of additional nuclear power plant units at Kudankulam site as well as in the construction of Russian designed nuclear power plants at new sites in India was signed on December 5, 2008 during the visit of the Russian President to India. The government has already gone on record as saying in the parliament that the cost of first and second units of KNPP is estimated to go up from Rs 13,171 crore (US$ 2.4 billion) to Rs 17,270 crore (US$ 3.1 billion) because of the delay in commissioning of the plant caused by various factors. The Civil Liability for Nuclear Damages Act has come into force with effect from November 11, 2011. The anti-nuclear energy activists got a shot in the arm on May 30, 2011 when Germany announced its decision to revive the previous government's phase-out plan and close all reactors by 2022. This meant that Germany’s eight oldest reactors operating life came to an end are shutdown, and would result in the remaining nine reactors not getting life extension by end of 2022. But then this is contrary to what the world is already doing. France, Poland and Russia (Kaliningrad) are expecting to increase electricity exports to Germany, mostly from nuclear sources and Russia is expected to export significantly. According to World Nuclear News (WNN), there are now over 440 commercial nuclear power reactors operating in 30 countries, with 377,000 megawatt electrical (MWe) of total capacity. They provide about 14 percent of the world's electricity as continuous, reliable base-load power, and their efficiency is increasing. 56 countries operate a total of about 250 research reactors and a further 180 nuclear reactors power some 140 ships and submarines. Today, only eight countries are known to have a nuclear weapons capability. By contrast, 56 operate civil research reactors, and 30 host some 440 commercial nuclear power reactors with a total installed capacity of over 377,000 MWe. This is more than three times the total generating capacity of France or Germany from all sources. The WNN says that over 60 further nuclear power reactors are under construction, equivalent to 17 percent of existing capacity, while over 150 are firmly planned, equivalent to 46 percent of present capacity. Sixteen countries depend on nuclear power for at least a quarter of their electricity. France gets around three quarters of its power from nuclear energy, while Belgium, Bulgaria, Czech Republic, Hungary, Slovakia, South Korea, Sweden, Switzerland, Slovenia and Ukraine get one third or more. Japan, Germany and Finland get more than a quarter of their power from nuclear energy, while in the USA one fifth is from nuclear. Among countries which do not host nuclear power plants, Italy gets about 10 percent of its power from nuclear, and Denmark about 8 percent. As nuclear power plant construction returns to the levels reached during the 1970s and 1980s, those now operating are producing more electricity. In 2007, production was 2608 billion kilowatt hours (kWh). The increase over the six years to 2006 (210 terawatt hours) was equal to the output from 30 large new nuclear power plants, according to WNN. Yet between 2000 and 2006 there was no net increase in reactor numbers (and only 15 gigawatt electrical in capacity). On August 17, 2011, the first Japanese reactor restarted. Unit 3 at the Tomari nuclear power plant on Japan's northern Hokkaido Island resumed operation after a periodic inspection. It was the first reactor to be restarted in the country since the Fukushima disaster. Even in the case of China, the mainland China has 14 nuclear power reactors in operation, more than 25 under construction, and more about to start construction soon.